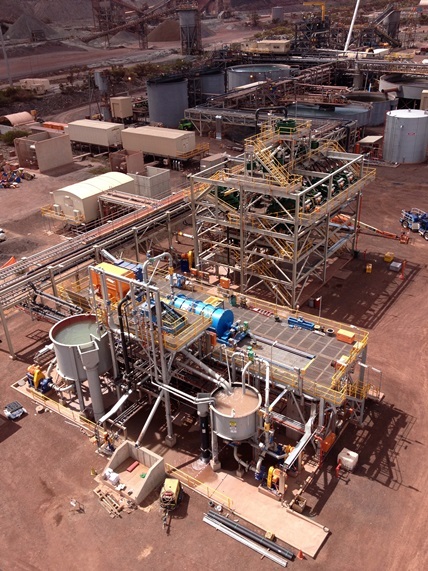 GR Engineering was contracted by Leighton Contractors to undertake the engineering, design, procurement, construction and commissioning of an upgrade to the existing Magnetite Concentrator Plant at the Iron Duke Mine Site. The scope required the throughput of the concentrator to be increased while maintaining grind size targets for quality reasons. This was achieved with the addition of a fine grinding system (XT IsaMill™) and a fine screening system (Derrick Stack Sizers™) into the existing circuit. Additional magnetic separation (single drum units) accompanied by upgrades to pumping systems, tailings handling, pipelines and water distribution circuits were also required. As these works were for an existing operation, GR Engineering produced the deliverables within the established systems and drawing requirements specified by the client. A combination of MicroStation 3D, AutoCAD, Solid Edge and iso.EDGE were utilised over the project. GR Engineering commenced the design phase for these works in November 2012 with mobilisation to site in March 2013. The works were undertaken to utilise the planned operational shutdowns and were completed on schedule. The final shutdown and tie-ins were completed in early November 2013 with Practical Completion achieved in mid-November 2013. Commissioning and performance testing were subsequently completed and passed before year end.